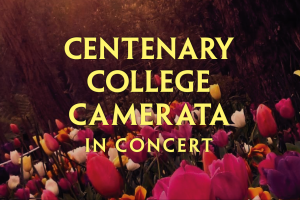 SHREVEPORT, LA — Music related to the Passion and resurrection of Jesus will be on the program for Centenary Camerata’s spring concert this year. The evening concert featuring primarily modern composers will be held in Anderson Auditorium at Centenary’s Hurley School of Music on Saturday, March 30 at 7:30 p.m. It is free and open to the public. The music selected for the concert reflects not only themes relevant to the Lenten season but also a variety of musical styles. “Precious Lord” (arr. Nathan Carter) and “Jesus Loves Me” (arr. Michael Hassell) come from the gospel and jazz traditions, while William Billings’s “When Jesus Wept” is an a cappella piece reminiscent of the Renaissance era. Pieces by Lili Boulanger and Dan Forrest provide a further contrast with a boisterous style that requires two accompanists. The concert also includes works by Randall Thompson, Frank Ferko, and Olaf Christiansen. Camerata, founded in 1983, is the select chamber choir from the Hurley School of Music. The composition of the group is primarily voice majors, though membership is open to all Centenary students by audition.